Dhairya Dand, a researcher at MIT’s Media Lab, thinks that we rely on our smartphones so much that we’re missing the world around us. We use our phones to navigate, to find new places, and even to locate our friends. He’s designed an electronic shoe insole that gives you little haptic signals to guide you so that you can free up your hands from your smartphone and actually look around you as you wander. 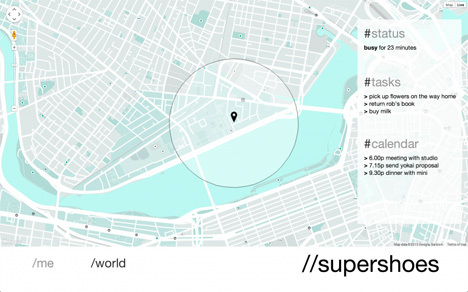 SuperShoes are, of course, paired with a smartphone app – that’s probably unavoidable. Users plug their favorite destinations and interests into the online ShoeCentral platform, giving the insoles some insight into where you might like to be guided. When you’re out walking, the SuperShoes will give your feet a little tickle to alert you to a suggested destination. The shoe insole also links up with your calendar and to-do list, reminding you when to do certain tasks and sending you on shortcuts when you’re running late. The most seemingly useful aspect of the shoes are as a navigation tool. Before you start out, you program your destination on the smartphone app. As you walk, the shoes tickle your left or right foot to tell you which way to turn. No more staring at the map on your phone or listening to a robotic voice telling you which way to go – just a set of tickly feet helping you find your way. The SuperShoes project would undoubtedly be helpful in everyday life, but Dand doesn’t plan to turn them into a consumer product. His goal was simply to create a tech product that wasn’t as invasive as those which already rule our every waking moment, but is just as useful.